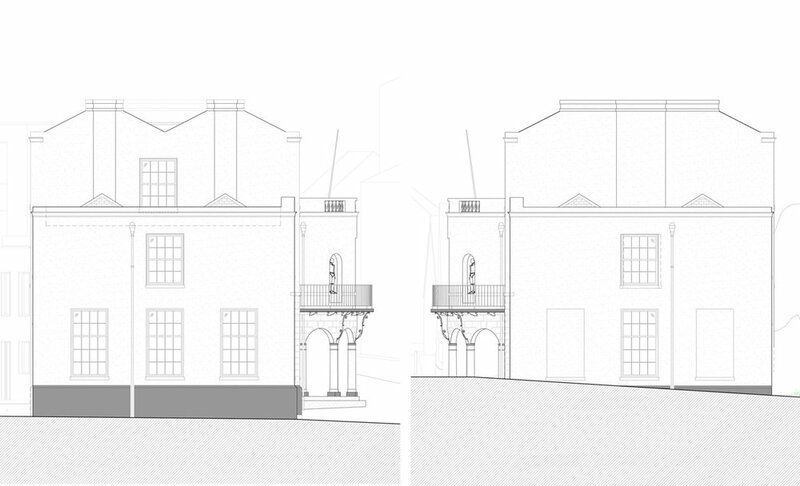 Sensitive conversion of Grade II* listed former Farleys Furniture shop into apartments. Designed by Mary Townley, one of the country’s first female Architects; built in 1792 Townley House remains a prominent late Georgian / Regency building in the town. 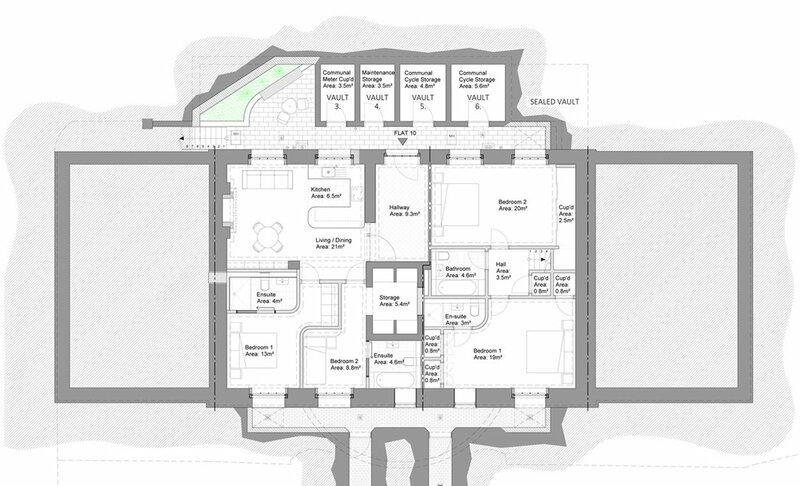 By uncovering years of neglect, we were able to re-configure the internal layout and arrangement of each new apartment by tracing the original layout. The desire to retain, restore and repair historic fabric whilst seeking to balance the needs of contemporary home owners enriched the scheme. 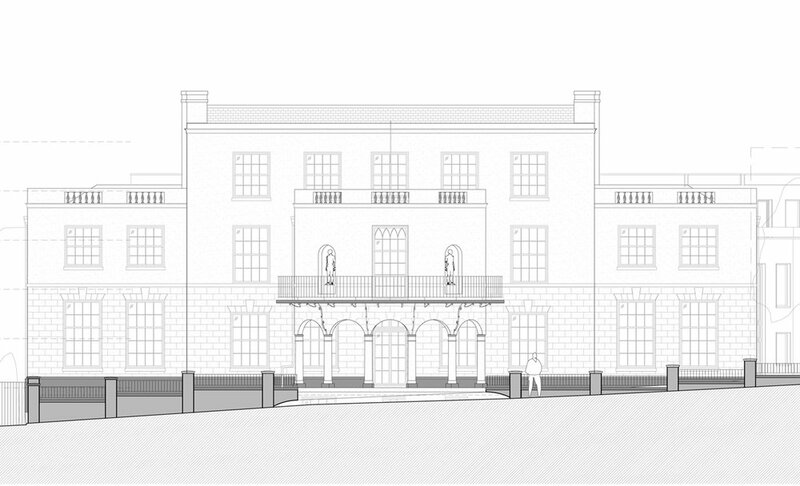 Extensive restoration works were proposed including: lime rendered facade, restoration of original ironwork, sash windows and doors; reconstruction of three Welsh slate butterfly roofs, renovation of internal encaustic floor tiling, reinstatement of in-situ plaster cornices and ceiling roses. Traditional works were carefully coordinated with modern works for separating the apartments to meet current building regulations. Fronting Chatham Street, the reinstatement of an extensive brick wall comprising piers and iron infill panels was informed by historic photographs and provides a secure historic frontage, softened by deep planted borders, unifying the new build terrace with Townley House. 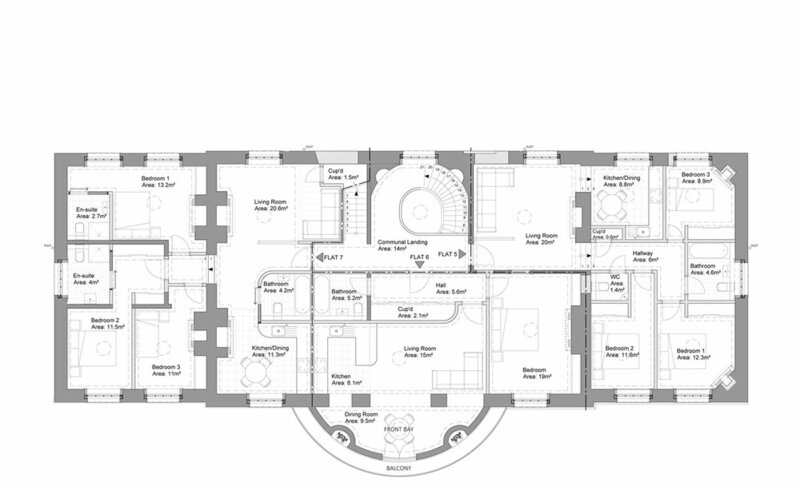 The proposed interior design of Townley House represents an expressive balance between historic features renovated or restored and the sophisticated palette of finishes demanded from a contemporary home owner. Huge Georgian sash windows provide high levels of daylight to play with so floor finishes are generally light in tone and feature oak herringbone, white oiled oak planks and light grey porcelain. Floor finishes contrast well against deep softwood skirting boards and architraves matching existing profiles including complimentary dado and picture rails. Rooms feature the reinstatement of plaster cornices to match original profiles and plaster ceiling roses to match a Georgian design. Original sash window folding shutters are renovated into working order and wall panelling is restored or reinstated for effect. Combined these features provide an exciting backdrop to experiment with a palette of bold and muted colour. Living spaces feature high quality fitted kitchens of a contemporary design and open in plan to dining areas and living rooms. Some living spaces feature full height glass privacy screening and others use remnants of existing walling to create areas of privacy. Apartments each feature a grand fire place either original or reinstated. Master bathrooms feature roll top baths, glass shower cubicles and fitted storage with stone tops. Room height and depth is maximised often by way of incorporating one of the properties huge windows filling the room with natural daylight. Finishes feature bold shades for joinery contrasting pale shades for walls. Bedrooms on the other hand feature walls and joinery including windows all of the same muted colour which provides a very calm environment and looks sophisticated. Communal areas such as the entrance hallway feature a renovated encaustic tiled floor leading to an original semi circular curved staircase, surfaces finished with bold and pale colours to reference the apartments and enhance the dominant nature of Townley House.